In the fall of 1975, First Congregational Church received notification that a gift of a new pipe organ was being offered by one of its members, who chose to remain anonymous. A special committee, headed by the late Claude Emery, was formed to oversee the purchase and construction of the new organ. After many months of deliberation and visits to several manufacturers, the committee selected the Schlicker Organ Company of Buffalo to build the instrument. Under the direction of then-service manager Donald Bohall and craftsman Wilfred “Tiny” Miller, the two-manual, 19-rank, electromechanical action organ was completed in a two-year period. 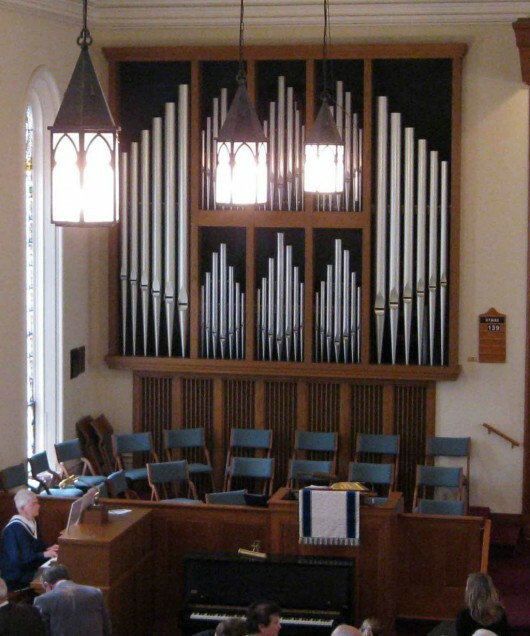 The organ was first used in the worship service of February 25, 1979. A month and a half later, on April 8th, it was dedicated in a special afternoon service with guest organist, Dr. J. Melvin Butler, of the Downtown United Presbyterian Church. Recitals were given once a year starting in 1979 through 1989. The eleven-year recital series, the longest of any suburban church in the Rochester area, included many of the finest artists in the Eastern United States. The organ contains 1,412 pipes, only a small fraction of which are visible at the front organ chamber. Its metal flue pipes are made of an alloy of tin and lead. The largest bass pipes are zinc, while the wood pipes are crafted from an assortment of hardwoods, cherry, poplar, and oak. Most of the individual stops on the organ like the Principal, Gedeckt, Walfloete, Rohrflute, and Salicional have 63 pipes for each stop. The mixture IV has 244 pipes; mixture III has 183 pipes. The replacement value for insurance purposes was quoted in 2003 as $340,000. The console, built with 50 feet of cable, is on rollers so that it can be easily moved. It is constructed of red oak and was stained to match the existing wood construction in the sanctuary. Next to the organ console is a wooden music cabinet constructed by the late Robert Lockwood in honor of Emma Cook, using the wood from the previous organ that was in the sanctuary. Our organ is tuned twice a year. Organ tuning is a very delicate procedure—if the pipes are tuned even a few degrees below normal operating temperatures they will not sound the same when the air is warmer. Our superbly crafted organ is such a lasting instrument that it can remain in use for hundreds of years if taken care of. We hope you enjoy our Schlicker organ!